I will have you a fellow this summer & you all can visit this place. Aw. That’s a true friend. 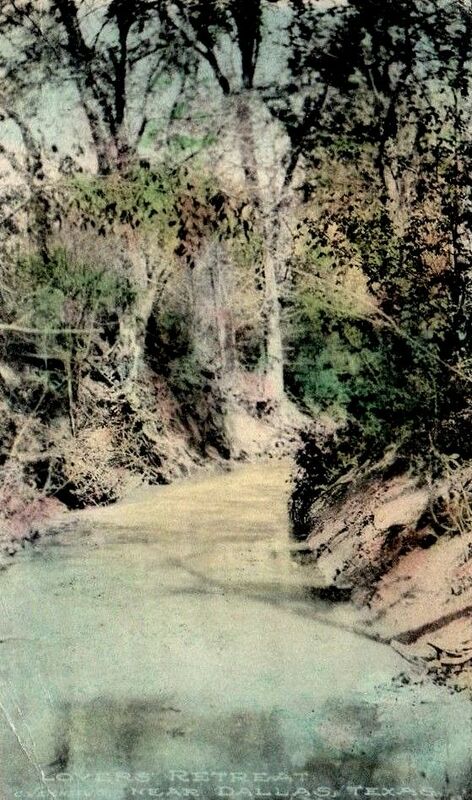 This might be any old “romantic” place called “Lovers’ Retreat,” but at the time of this card’s publication, Lovers’ Retreat in Palo Pinto County, near Mineral Wells, was a well-known destination for Sunday drives, picnics, camping, church retreats, and family reunions. At 100 miles from Dallas, it would be stretching things to say this view is “near Dallas,” but postcards are sometimes not completely truthful. 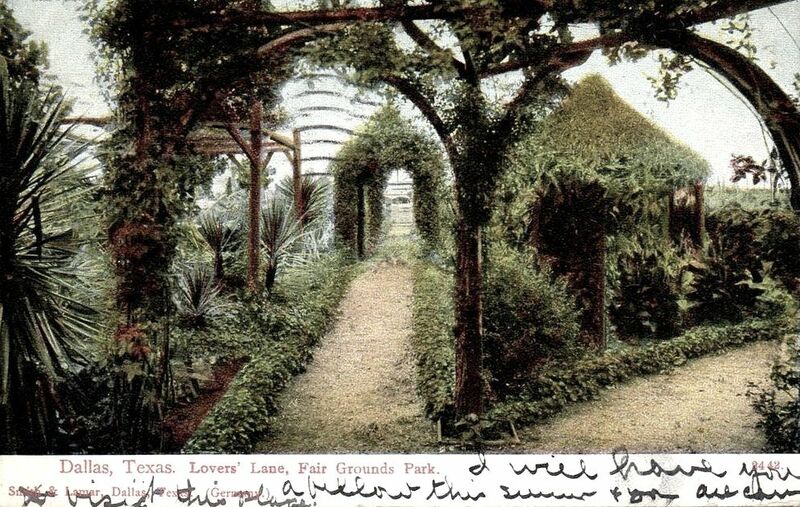 Speaking of lovers’ lanes, I’m not sure where that one at Fair Park (in the top postcard) was, but there were several “lovers’ lanes” around the city. The thoroughfare we know today as Lovers Lane was apparently known for years as a secluded place popular with couples looking for places in which to “spoon.” In a Dallas Morning News article, writer Kenneth Foree reminisced about the days when “it was nothing but a narrow black dirt road winding between two rows of bois d’arc trees.” He commented that “at times you could find lovers under nearly ever tree in Lovers Lane. They would park there in buggies in the early days, later in cars.” In the same article, Margaret L. Pratt, head of the Dallas Public Library’s Texas history department, remembered that “when Southern Methodist University was young and virtually treeless, students would often walk to nearby Lovers Lane for a shady hand-in-hand stroll” (“Walk a Miracle Mile” by Helen Bullock, DMN, Sept. 10, 1961). 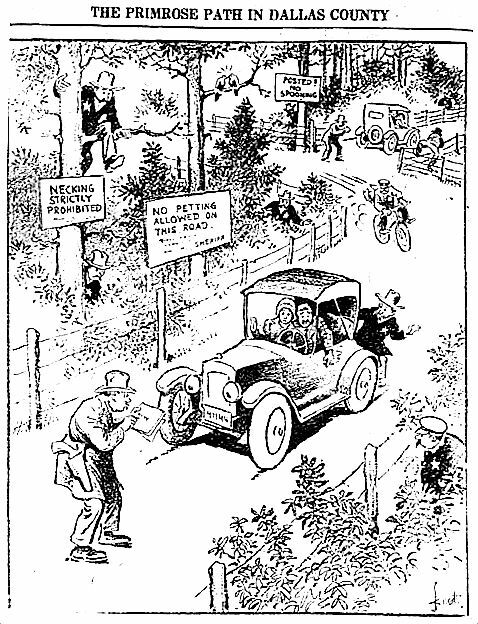 When the 1920s hit, “lovers lanes” around the country became hot topics of conversation. This was the “Jazz Age” and the era of the outrageous flappers — a time which an older, disapproving generation saw as scandalous and lacking in respect for propriety or morals. They felt that young women, in particular, were not acting at all “ladylike.” Suddenly the term “petting parties” was all over the newspapers. Young people (…and older people) were making out at parties, in movie theaters, and, especially, in cars parked at night along out-of-the-way country roads. Things were heading to hell in a handbasket. 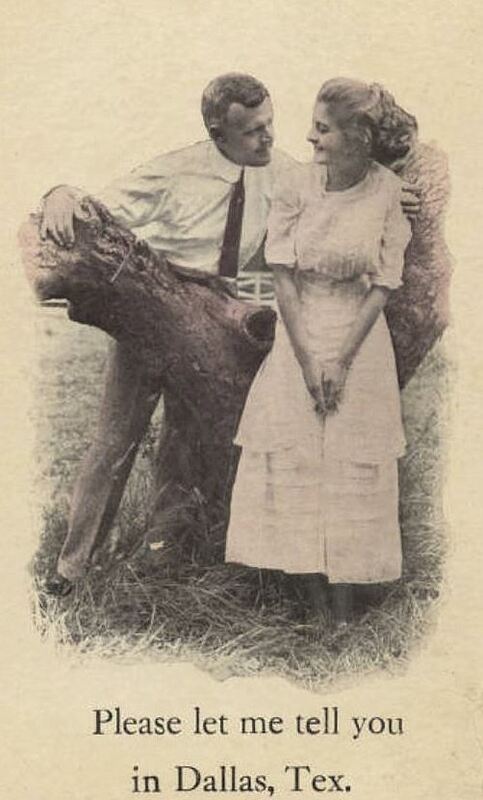 When a Dallas deputy sheriff commented to the local newspapers in 1924 that these open-air necking sessions were out of control, the mayor, Louis Blaylock, said, “It’s getting so a man can not take his sweetheart out on the country road to court her or to propose to her…. 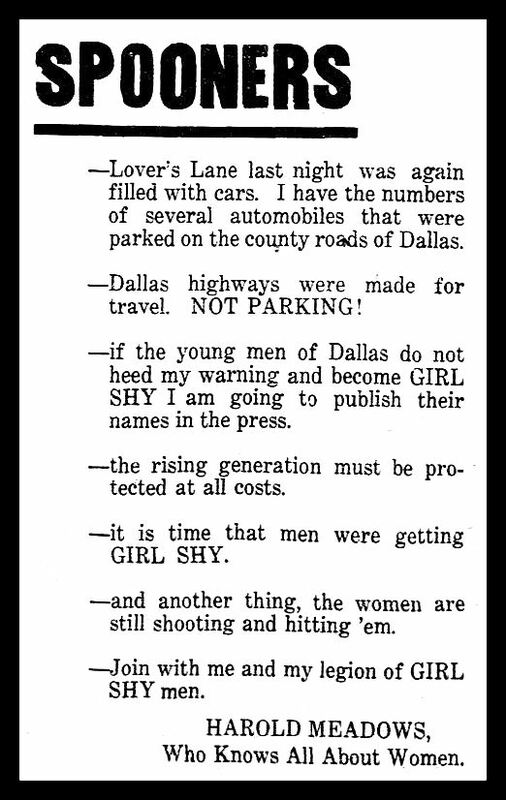 Most of the folks celebrating their silver and golden anniversaries in Dallas can look back upon the time when the Lemmon avenue road and Mocking Bird Lane were the causes of all the trouble…. Things aren’t so much worse now than when I was a boy” (DMN, May 23, 1924). Mayor Blaylock — who was born in 1849 — was 74 years old at the time. The deputy sheriff was Not Amused (read his response, reprinted in the Sulphur Springs Daily News-Telegram, here). The mayor laughed off the deputy’s concerns, saying, “I believe that most of [this] talk is purely political and if my memory serves me right we experience this epidemic about every two years, just about election time,” (DMN, May 30, 1924). Despite the mayor’s pooh-poohing of the situation, petting-party outrage remained in the headlines throughout the ’20s … until the public’s attention turned to the next thing to be outraged about. Good for those scandalous pre-Code movies, though! 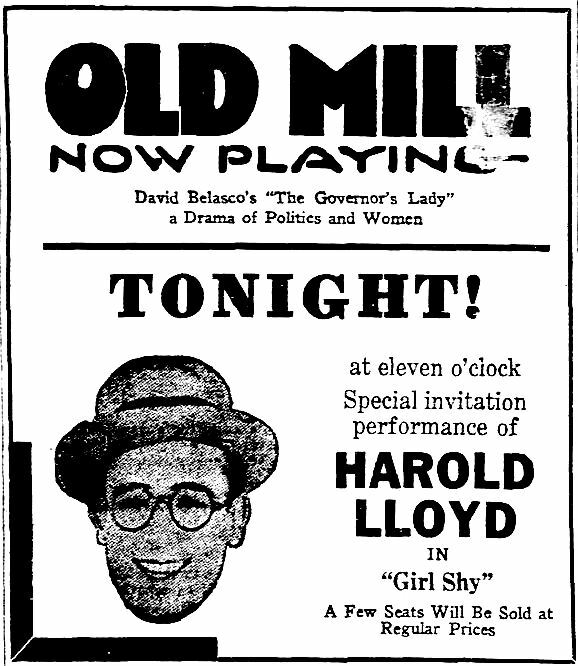 Below is a clever promotion for a movie called “Girl Shy” in which Harold Lloyd played a character named Harold Meadows (“who knows all about women”). It is addressed to the “spooners” of Dallas and is not identified as being an ad for movie. Top two postcards are currently for sale here and here. 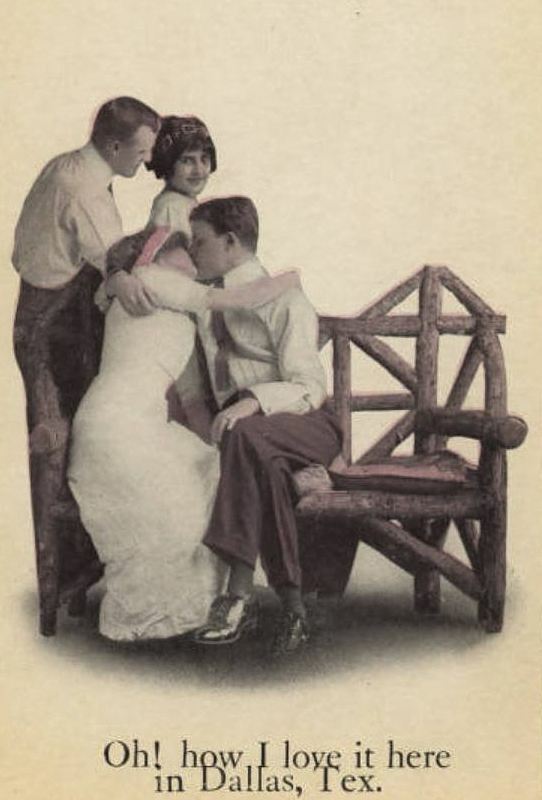 The two postcards featuring amorous couples are from the George W. Cook Dallas/Texas Image Collection, DeGolyer Library, SMU Libraries, Southern Methodist University; more information on these postcards can be found here and here. A photo of young frolickers frolicking at Lovers’ Retreat in Palo Pinto County can be found on the Portal to Texas History website here. Read about petting parties in an article from NPR, here.